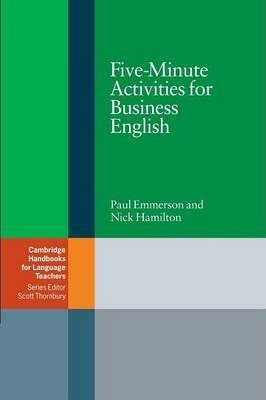 This comprehensive resource book contains an easy-to-use set of short activities essential for anyone teaching Business English. Reflecting real-life business activities such as emails, noisy telephone conversations, making excuses, negotiating, handling customer complaints and cultural awareness, Five-Minute Activities for Business English helps teachers mirror the pacey feel of the work environment. This book is also of interest to teachers of general English who are looking for stimulating skills-based activities in meaningful contexts and complements both tailored and coursebook-based materials. The four main areas covered are 'Business topics', 'Business communication skills', 'Language work' and 'Exploiting coursebooks'. These areas feature activities on various topics such as money, finance, meetings, negotiations, telephoning, management, marketing, etc.